EXPERIENCE a time when our nation was fully united - with an authentic 1942 Roadshow & Radio Broadcast - the songs, dances and laughs America has loved for over 70 years! Winner of the 2017 Branson Terry Music Awards for “Outstanding Morning Show” and 2017 Branson Show Award Winner for “Most Patrotic,” this award-winning homage to the days of Bob Hope and war-bond drives features Broadway Veterans Jody Madaras and Valerie Hill, a cast of New York voices, the rich sounds of the LIVE Hollywood Victory Caravan Big Band Orchestra, classic commercials, tight harmonies, impromptu skits, Sing-A-Long excitement, and 42 of the greatest American songs ever written — not to mention a full-circle patriotic salute to the American way of life. 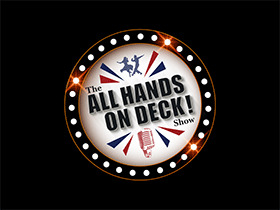 COME CELEBRATE America with The ALL HANDS ON DECK Show!